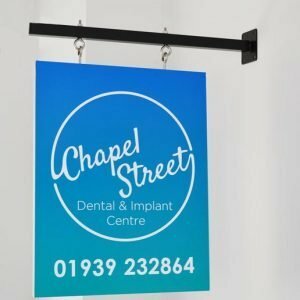 A hanging sign is the perfect way to make sure your business has a presence in the high street. Having a professional, eye-catching hanging sign will make your business easily visible by shoppers at a glance. It will grab the attention of potential customers and provide a point of interest. Pedestrians often walk past shops without paying much attention to window displays, but a hanging sign extends your presence into potential customers’ eye line. 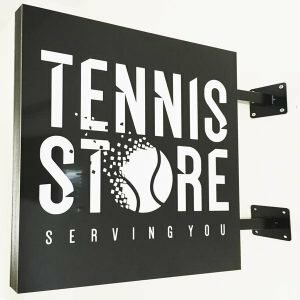 A professional hanging sign can also make a customer notice your store before a competitor’s and gain their custom. Make sure you present your business professionally. 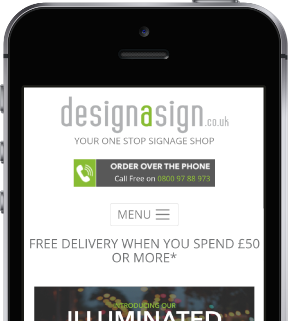 We have a selection of different hanging signs to meet your needs. Our hanging aluminium sign is perfect for use outdoors and is a great universal option to grab customers’ attention. These signs have a foamex core with aluminium faces. You can then have your desired text, logo or other images printed onto the sign using a high quality weatherproof vinyl. The sign is our most rigid and is easily noticeable by customers. You will have seen these signs hanging in places like indoor shopping centres. A projecting sign grabs the customers’ attention and makes you stand out from your competitors. These are also often used in shared offices or buildings so that potential clients are sure not to miss you. Made from a single foamex core and 2 faces of aluminium, it is then printed with your design on both sides, using high quality eco solvent inks for a lasting finish. All of our hanging signs come with hanging brackets and fixings so you don’t need to worry. Our free design service is also available to make sure you get the perfect product.